As Umbraco matures I am assuming that needing to reset directory permissions might well become a thing of the past, but at the moment it is still something when I copy sites between machines that I often find myself doing. As it's 4:30am I thought, there must be a better way than having to open up a DOS prompt, navigate to a directory and then run a batch file passing in the IIS root folder location. I googled for adding a command to the context menu within Windows Explorer, I found a way of doing this for XP, but it seems the functionality was removed from Windows 7, however I found a very neat freeware application called File Menu Tools which does work perfectly! 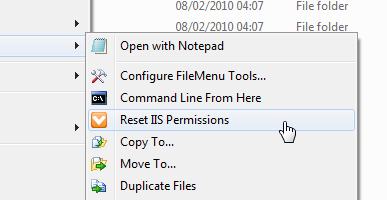 I have now added a command to my context menu that enables me to right click an IIS site root folder and then call my batch script and automatically pass in the directory. Any way we could get the script as well as the little icon you're using there? This seems like a true time saver for us! Thanks a lot, all the best to Vizioz. You can get the script on this blog, just click the "Umbraco Scripts" label above these comments and you will see all the blog posts I have done related to the permissions script. As for the icon, it is our FAV Icon, which you can get from our website if you'd like to use it for this your more than welcome. We are at last developing our website which will be launching by the first week of August, at which point I will hopefully be doing some more blogging!